When preparing for and responding to emergencies, you must care for yourself in the process. It is one thing to have your supplies ready, and another to carry them while in action helping others, or for your own survival. That is why BackTpack, the ergonomic emergency preparedness/evacuation pack, is especially important for this use. BackTpack is designed by a physical therapist for the person doing the carrying. "The Clackamas County Medical Reserve Corps Unit (MRC) is a group of medically-licensed volunteers trained to deploy in response to large public health events. The BackTpack is a perfect tool for deployment, due to ease of access while wearing, ability to wear for long hours free of back pain, and security as it does not need to be removed during work hours. Some of our MRC volunteers are buying them for themselves for personal use. I love my personal BackTpack!" Above: A BackTpack 4 loaded with all the items described in the Sample 3-Day Evacuation Kit, plus a cell phone and water bottle on the outside. The bag is filled to less that half of capacity, so there is more room for clothing, dog food, and other necessities. The weight is evenly distributed so the wearer can be comfortable and move freely, while having access to items at all times. In the event of a tsunami, your survival will depend on your ability to get to high ground in a short time and have 72-hour survival supplies available. Your county emergency planners have a list of what supplies to have ready in a grab-and-go bag. 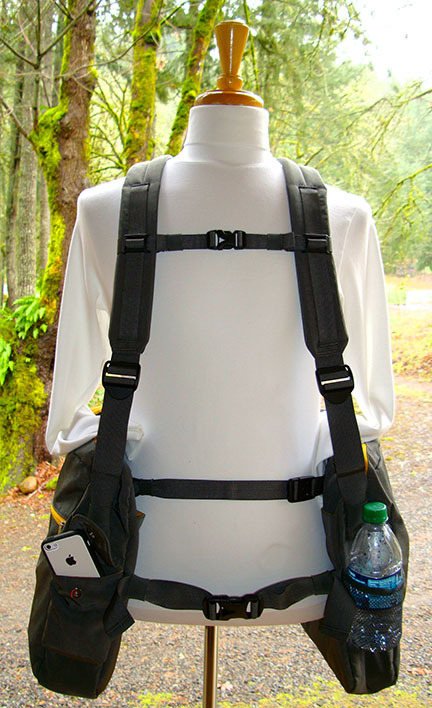 Use BackTpack to create the best ergonomic emergency preparedness pack possible. We recommend BackTpack for your grab-and-go bag, because it is an ergonomic system which will be easier on your body, allow you to run more easily, and have access to the contents at all times. In addition, with BackTpack you are aware of the space you occupy and have better balance than with a conventional backpack. BackTpack is available in sizes to fit most family members. Monitor your Target Heart Rate, so that you can gradually increase your fitness while decreasing your time. Get your Target Heart Rate from your health care practitioner or the American Heart Association. Gradually increase your load each trial until you have the full 72- hour kit. If you have an extra BackTpack, you can use it for training, both on the trek and in your home on stairs, gradually increasing the load. Make sure you choose a training regimen that is safe for you. This sample weighs 5lb 12oz and is generic. Each person should learn about their specific preparedness needs. This water is for initial use, after the rush of adrenaline dries the mouth. For regular water use, seek other sources. Blankets reflect about 80% of your body heat back at you, preventing rapid heat loss in cold weather. This blanket will not keep you toasty warm, but will save your life. Use in conjunction with the emergency blanket to create more heat reflected back by the blanket. Playing games alleviates stress in the aftermath of a disaster. Add a folder to your kit with copies of important medical information, crucial contact numbers, copies of social security cards, birth, marriage, and death certificates, bank account information and documentation. Having this information easily available will make life after an evacuation much easier. If you take medications or use special medical equipment, include a spare set of equipment, including prescription glasses, in your kit. If you use oxygen, make arrangements to have portable O2 available with your kit. If you use a power wheelchair, it is highly recommended that you purchase a collapsible light-weight back-up in case of evacuation without a special vehicle. Include at least one month's supply of all medications. After a disaster, pharmacies may be low on supplies or unable to get shipments for an unknown amount of time. Add a pair of socks and underwear to your kit. If you have adequate room, add a full change of clothes. Add more items as you like and are able. 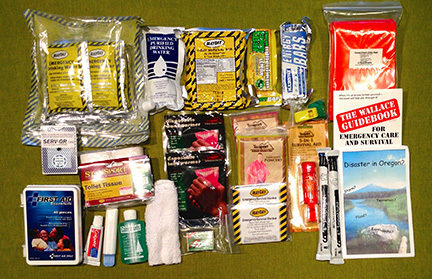 Hygiene supplies, knives and other tools, water purification, and comfort items are examples of types of supplies that would be valuable in your kit.